Sherlock Holmes and the Case of the Jersey Lily is an American play, written by Katie Forgette and directed by Andrew Mayer, performed at the Acadia Repertory Theatre (Mount Desert, ME, USA) from 16 august to 4 september 2011, starring David Blais as Sherlock Holmes and Brian Hesser as Dr. Watson. 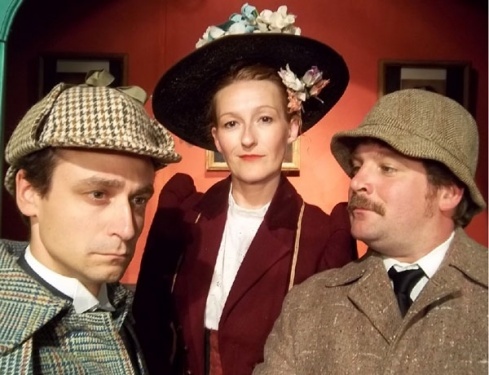 Sherlock Holmes (David Blais), Lillie Langtry (Julie Ann Nevill) and Dr. Watson (Brian Hesser). © Photos : Acadia Repertory Theatre.